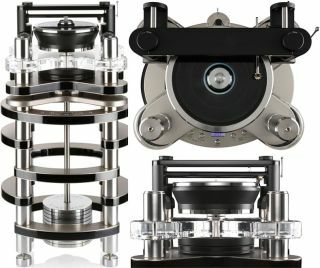 Clearaudio unveils £92,500 Statement v2 turntable | What Hi-Fi? Designed and made with a cost-no-object philosophy, Clearaudio’s second generation Statement turntable is the result of 40 years of engineering knowhow. Clearaudio certainly intends to make a statement with its latest turntable. Featuring a large, fully damped, integrated stand, comprising four legs and eight curved supports made of Panzerholz, a high-density, bullet-proof manufactured wood, and sandwiched between aluminium plates. Like its successor, the v2 uses magnetic bearing technology, which magnetically suspends the platter from the drive motor. The motor uses a belt-drive mechanism to drive the lower of the two sub-platters. An upper sub-platter floats above it with a bearing spindle attached, which is connected to the main platter. The v2 also retains the controlled motor used to drive the sub-platter, which has an “outstanding level of real-time control". However the v2 comes with new electronic circuitry to provide “more precise speed control and stability”. The gyroscopic bearing that supports the floating structure has been upgraded too, and now features a 95kg damped pendulum hanging from the bearing. Clearaudio says the Statement v2 can accommodate up to four tonearms, and has produced the £18,500 Statement TT1 v2 tangential tonearm specifically for it. The TT1 claims “zero lateral tracking error and no skating force” due to the way the cartridge moves with the record. If the idea of setting up the Statement v2 in your own home is a little daunting then fear not, with each purchase Clearaudio will send out a senior member of its team to assist you. The Statement v2 is available now for £92,500.